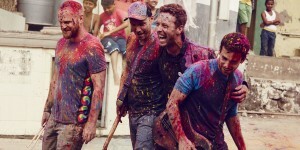 Coldplay’s latest album ‘A Head Full Of Dreams’ may have been the band’s first to miss the No.1 spot here in Australia in 15 years (their first ever in the UK), thanks to Adele, but that the album was released at the start of December and still finished the year as the 22nd biggest of 2015 speaks volumes. The band has kicked off 2016 by setting free the video for the latest single to be lifted from it, ‘Birds’. This one’s been filmed at the incredibly photogenic, incredibly colourful Salvation Mountain in southern California, where the boys can pose in amongst its vibrancy. It’s got an old-school filmic treatment on it too, giving it an earthiness that’s missing in many of today’s more polished offerings.